Insulated compressor sound covers are used extensively in the HVAC and industrial process cooling industries to control compressor noise. Deluxe model compressor sound absorption covers installed on Advantage model Ti-80A central chiller with two tandem scroll compressors. Covers provided by Fabrication Services, Inc. Fabrication Services, Inc (901-366-7500 www.fabsrv.com) is a provider of compressor sound absorption covers. The durability cover is a benchmark cover, used as the standard compressor cover by many OEMs. It is made from reinforced vinyl that is sewn around a 2.0 lb density fiberglass blanket. This cover offers good sound absorption at an economical price. This cover features the same construction as the durability cover but the added dimension of an extra layer of a 12 oz load barrier material for additional noise control. When additional absorption control is needed, customers turn to the deluxe compressor cover which adds an extra absorbing to the durability plus cover. This cover has shown superior results with greater than a 12 dBA noise reduction in some applications. Use when severe conditions or excessive heat is an issue. 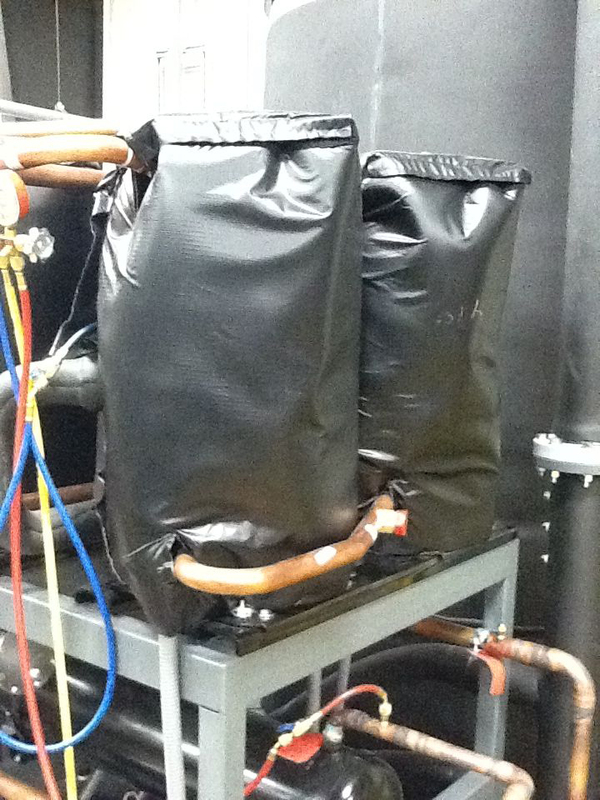 The material in this cover consists of a quilted fiberglass fabric over a 1" thick fiberglass filter. This material is usable up to 500°F. Would you like to Download FYI #296 to your browser?